We are excited to announce that we are moving to our home studio at the end of August 2017. We will be continuing to do Weddings and special events but no longer operate as a full retail florist. It was not an easy decision to make, but the good news is that I will have more time to dedicate to all the Brides and Grooms whose wedding flowers we are doing in 2017 - 2018 and beyond, as well as allowing me to be a mum to my gorgeous little girl. Our old shop front will be under new management as of September 2017 and the new owners Rachel & Gabe are very excited to open their store Saint Valentine and they will continue to look after our customers with the same passion as us. We are very excited for this new chapter for Orchid & Vine and we want to take this opportunity to say a HUGE THANK YOU, to each and every one who has supported us over the past 2 years, (and especially to all the people who came in during our transition and were so understanding with why we made this decision). We will miss you Hackett!! It’s with mixed emotions we announce the next phase for Orchid & Vine Florist! Don’t worry we aren’t leaving just yet! I have decided to put the shop up for lease, and we will continue to trade from our shop front in Hackett until someone takes over the lease. It’s not been an easy decision, but I want to do the right thing for my family and be the best Mum I can be. Weddings are my passion and my dedication to my wedding clients is still a huge priority so we have decided to create a home based studio to balance the workload! I look forward to creating beautiful flowers for all our existing brides and for new brides into the future. We wanted to say a BIG thank you for your love and support these past 2 years. We had so much interest in our Workshops last year, and as much as we would love to host our workshops again this year we’ve had to take a break. Unfortunately It isn’t an easy decision, but with our wedding business growing and our baby girl, we have limited free weekends to offer these courses. We’d like to assure you that all workshop vouchers are still valid, make sure to get in touch with us and we will organise a date for your workshop or if you would prefer the voucher can also be redeemed as store credit. Terrariums have grown in popularity over the past few years, and it's easy to see why. They are a great way to bring a miniature version of the outdoors inside and they are quite low maintenance. They come in all shapes and sizes and can be styled to your taste. But best of all is they are super fun to make! Begin by filling the bottom of your container with a 1-2cm layer of perlite. The perlite acts as drainage and collects any water that reaches the bottom of your container. It also makes a nice contrast to the other darker layers. Pour a thin layer of activated charcoal on top of the perlite. Activated Charcoal helps clean the air of your terrarium and refreshes the soil. Perfect when used for a closed top terrarium. Add a layer of Sphagnum moss across the charcoal layer. This will act as a filtration system and stop potting mix from falling into the drainage area. Add a layer of soil ensuring it is deep enough to cover the roots of each plant. Remove your plants from their containers and brush off the loose soil around the roots. One by one using the end of a spoon make a hole big enough for the roots and place the plant inside. Firmly tamp the soil down to hold each plant in place. If you would like you can top of your terrarium with more sphagnum moss, some sand or pebbles or even some small figurines. Lightly water once per week in summer and once per fortnight in winter, watering only the live plants and avoiding mosses. For an open terrarium, the soil should always remain barely moist, never bone dry. Prune back dead foliage or overgrown plants as needed to prevent rotting. Terrariums thrive in natural, indirect light. Avoid placing in direct sunlight or other hot areas as you can actually cook the plants or burn foliage that is touching the edges of the vessel. Mist your terrarium every few days to provide ample humidity. We've had so much interest in our Workshops and we're here to tell you about our latest Workshop dates. 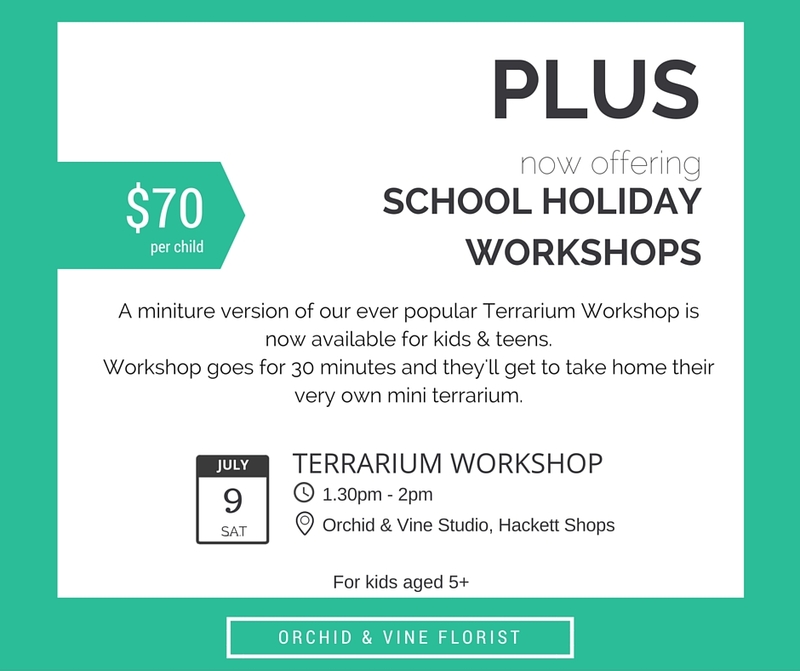 Over June and July we will be hosting 4 of our regular Floral and Terrarium Workshops, and we're excited to announce our very first Kids School Holidays Workshop, a miniature Terrarium class for kids and teens. We've got all the details of the dates and times below! If you haven't already booked a spot in one of these workshops, make sure to book in now as spaces fill quickly. Brand new stock in store! We are currently branching out with our giftware ranges, and are really excited to be offering a new range of giftware in store this week, just in time for Christmas! Orchid & Vine Florist are now proud stockists of gorgeous candles made by The Little Flame Co, beautiful earrings by local jewellery designer Tangs Designs, lovely screen printed designs in the form of table linens, tea towels and purses from Blue Radish, artwork by local artist Alison Gumbleton and much much more. Don’t leave it too late to check them out though as stocks are limited. Come in and visit us today and check out all our new goodies…. see you soon! Hacketts Parties at the Shops made for a fantastic Saturday out with the family. With the most beautiful weather and fantastic entertainment it was such a eventful and entertaining day. There were guest performers like the Canberra City Band, Merici College Dancers, Folk Dance Canberra, Campbell High Band, Dinesh Moylan, local couple ‘The Telepathetics and performers from Dickson College. The performers did an excellent job keeping all who attended entertained. If you couldn't make it this year, thats okay. There are already plans underway to do it again next year.